Mantegna was an Italian Renaissance painter of well regarded influence, who was known for his visual experiments in perspective and spatial illusion. His work is known to have some influence on great painters of the time, including the German artist Albrecht DÜrer and Italian painters Giovanni Bellini and Leonardo da Vinci. Much of his ambitious life as an artist branched off after leaving his birth home of Padua, in Venice. Before that he was under the tutelage of another Paduan painter Francesco Squarcione (1397 - 1468) at eleven years old and was influenced by Squarcione’s love of ancient Roman art. Although a favorite student of Squarcione, Mantegna became disgruntled at his teacher profiting off work he had done. It was then, at the age of seventeen that he left Padua, never to return, exploring his ambitions in Verona, Mantua, Rome and possibly Venice and Florence. His early work in Padua included an altarpiece for the church of Santa Sofia (1448) and decorations for the Ovetari Chapel in the church of Eremitani. Most of these works were lost during 1944 due to World War II bombings. He also completed two frescoes of Saints at the entrance of the Church of Sant’Antonio and a 1453 altarpiece in the Church of S. Giustina of Saint Luke. His fresco in the Ovetari Chapel survives in a sketch he had done and it shows an unusual worm’s-eye perspective of St. James’ Execution. In these early inklings of spatial experiments, he also used the worm’s-eyed view in, The Holy Trinity with the Virgin, St. John and Two Donors. 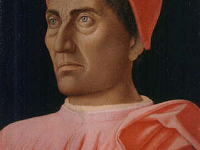 Once Squarcione’s favorite pupil, Mantegna’s studiousness gained him favor while training under Italian painter Jacopo Bellini (1396 – 1470). Bellini even gave his daughter’s hand in marriage to Mantegna in 1453. 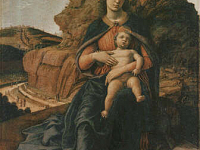 Before his position as court artist for Ludovico Gonzaga in Mantua, Mantegna painted an altarpiece of the Madonna with Angels and Saint in the Church of San Zeno Maggiore in 1459. He then created several masterful works, some that were portraits of the Gonzaga family, in what is known today as the Camera degli Sposi. He lived well in these years under Gonzaga’s court. Mantegna’s life saw great distress in the years that followed though, as death fell upon his patron, Ludovico, his wife and also his son, Bernardino. Mantegna grieved for several years and it was not until Francesco Gonzaga of Mantua commissioned him that he fully re-entered his artistry. In Rome, 1488, he completed frescoes commissioned by Pope Innocent VIII for the Vatican, but it was a stifling experience for an artist who enjoyed creative freedom in Mantua. 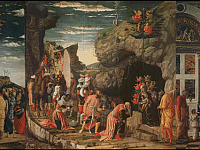 He rediscovered it upon return to the city under Francesco Gonzaga’s wife, Isabella d’Este’s influential cultural presence in the court, to which Mantegna obliged to in works around the court. Mantegna also created a number of Engravings, which the biographer Giorgio Vasari attributed to him; though the artist never signed or dated the works. His masterful collection of works are seen in the Uffizi Gallery in Florence, The Louvre in Paris, The Dresden Gallery, The National Gallery of Art in Washington D.C. and in Museums, galleries and historic places throughout Berlin, Copenhagen, London, Milan, Madrid, Venice and Verona.